This manuscript by Clairton F de Souza, Michael Kalloniatis, David L Christie, Philip J Polkinghorne, Charles N J McGhee and Monica L Acosta examines the distribution of creatine transporter in the aging human retina, particularly after retinal detachment. The questions behind this paper have ultimately to do with examining markers of energy metabolism in the retina and any impact on pathology in the retina (and be extension into the brain). Creatine and phosphocreatine are intimately involved with maintenance of ATP levels and are therefore found in high concentrations in tissues that maintain high metabolic loads, like the retina. Creatine is obtained from the diet and maintained in cells with an uptake pump, plasma membrane creatine transporter (CRT) that transports creatine from the blood/serum into the cell. The maintenance of creatine is of fundamental importance in a variety of pathological conditions and as such is an area of hot interest in neuroprotection and supplementation. This paper examined how the distribution of CRT changes in in the aged human retina and how this expression pattern is modified after retinal detachment. 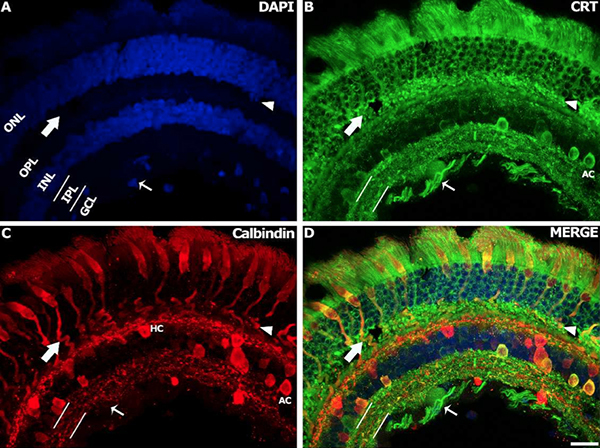 The authors found CRT expression in the normal aged retina particularly where one might expect it in the photoreceptor inner/outer segments and terminals, but also notable subpopulations of amacrine cells and ganglion cells with their respective distributions of dendrites and axons. Notably it was absent in glial cells in the normal aged retina. HOwever, it looks to me like there is additional labeling in bipolar cell subpopulations as well… Regardless, under conditions of retinal detachment, the authors found CRT labeling increased in those same cell photoreceptor, amacrine and ganglion cell populations as well as sites of creatine transport (blood vessels and RPE). The results simply suggest evidence of increased metabolism in cells that have become stressed. Its a nice introduction and I hope the authors follow this manuscript up with additional papers looking more carefully at cell populations involved as well as other indicators of cell stress. The paper also dovetails with additional work in other labs that demonstrate glial cells as a biosynthetic source of creatine. However, it seems that their conclusions that creatine from glial cells is not a source to other retinal neurons is still an outstanding question.